Making an Advanced Dining Reservation begins with the same process whether a guest has allergies or not. Simply go to the MyDisneyExperience app or use the Disney planning website to choose a restaurant and time for a reservation. You can also call 407-WDW-DINE. See the Dining homepage for more details on this process. When making your reservation online there will be a location for special requests. In the special request box list all allergies that could be a problem while dining. You can also request a visit from the chef or a consultation with a dining specialist. These people can assist you in choosing foods from the menu that are allergen free or can prepare a special meal that will be safe to enjoy. You can always ask your server about options that are allergy friendly as well. If you expect to have challenges with dining while visiting Walt Disney World resort contact Special.Diets@DisneyWorld.com at least 14 days prior to your visit. Be sure to make use of this service if you have 4 or more allergies, if more than one individual in your party has severe allergies, or if anyone in your party has a metabolic disorder. 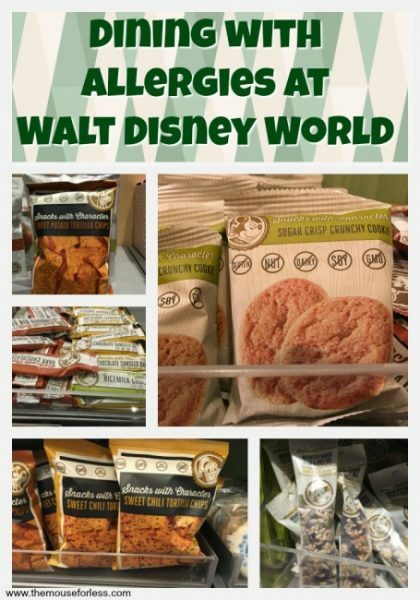 Even if you do not have one of these specific issues, anyone who requires special dietary considerations is welcome to contact the dietary team at Walt Disney World for assistance with dining. These allergies can typically be accommodated at dining locations without any advanced notice. If a guest with allergies wishes to speak to a special dietary consultant or a chef that request can be accommodated at any Disney restaurant. The content of the allergy-friendly menus has some variety across Walt Disney World restaurants and snack locations. Although typically some common menu replacements include chicken strips and allergy-friendly brownies or chocolate-chip cookies. Disney does not guarantee that foods served to guests are allergy free. They acknowledge that these foods may be prepared near foods that may contain allergens, and they rely on the accuracy of food labels from the manufacturing companies to determine the ingredients of processed foods. Guests dining with allergies at a table service restaurant are more likely to find a food that will be allergy friendly. When making your dining reservation be sure to indicate any food allergies so that the restaurant can be prepared. Common allergies are typically easy to accommodate, and chefs will have a normal meal that can be substituted. Chefs are normally available to visit with guests who have special dining needs. At buffet dining locations, a chef will point out to guests which foods are safe for their allergies and which foods should be avoided. If there are limited options that a guest can choose from, an allergy-friendly meal may be prepared. At quick-service dining locations guests with common allergies can typically dine off of the common allergy menu. If a guest has a unique allergy they can request to speak with a chef or manager, and if it is possible a special meal may be created. This can take some time, as the restaurant will have to accommodate the dietary request and they may be extremely busy depending on the time of day. Guests dining with allergies at a snack location can typically dine off of the common allergy menu if the location offers an allergy friendly alternative. Be aware that some snack locations do not have allergy friendly alternatives. If you are dining with allergies at a table-service restaurant and are making an Advanced Dining Reservation special dining requests are easy to make. When making a reservation online, simply type in your special request into the box set aside for special requests. When making a reservation over the phone, tell the Cast Member making your reservation about your dietary needs and they will list those with your reservation. Anyone who expects to encounter problems when dining at Walt Disney World should contact Special.Diets@DisneyWorld.com at least 14 days prior to your visit. When dining with allergies without a reservation at a quick-service or snack location most likely you will simply need to order from the allergy-friendly dining menu. If this menu does not accommodate your needs, then you can speak to the Cast Members in the restaurant and they may be able to prepare a meal that is allergy friendly. This is not always the case however, especially with severe or uncommon allergies. Anyone who expects to encounter problems when dining at Walt Disney World should contact Special.Diets@DisneyWorld.com at least 14 days prior to your visit. Guests are always allowed to bring their own food into Walt Disney World parks and resorts. If anything is an issue with security explain that a guest has allergies and requires a special diet. Keep in mind that food cannot be in a glass container, this includes any glass bottles, glass bowls, or glass jars. Small coolers are permitted as long as they are smaller than 24″ x 15″ x 18″. Typically, a soft sided cooler without wheels is the best way to go, but hard-sided and wheeled coolers are permitted as long as they meet the size requirements. Lockers can be rented at the front of each park so that food does not have to be carried all day. Guest Relations or First Aid can store any medications in refrigerators upon request.